Was pleased to support the launch and funding efforts of Memoirs of a Dilettante Volume I. It is now time to reveal the cover for Volume II. MEMOIRS OF A DILETTANTE VOLUME TWO – COVER REVEAL! 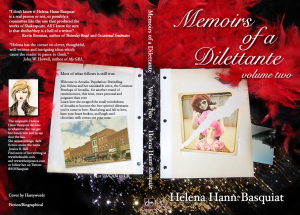 Memoirs of a Dilettante Volume Two is the second collection of reminiscences, following Helena Hann-Basquiat, a self-proclaimed dilettante who will try anything just to say that she has, and her twenty-something niece, who she has dubbed the Countess Penelope of Arcadia.